Rock art sites are part of the cosmology and beliefs of Indigenous peoples. They are gateways to communication between humans and the Spirit World. They are also significant places for ritual activities. These sites are often linked to medicine men who created rock art images. At these sites, medicine men practised rituals for various purposes, including healing. Medicine men, their rituals and their visions are represented in Canadian rock art. The sites are also linked to the vision quests of Indigenous youths who, during coming-of-age rituals, sought to establish contact with their guardian spirits. Rock art sites were, and still are, places conducive to communion between humans and spirits. Images found at these sites often represent the visions experienced during quests. Rock art images were also created to commemorate special historical events. On the Western Plains, there are battle scenes at Áísínai’pi. Sites in British Columbia commemorate battles or shipwrecks. 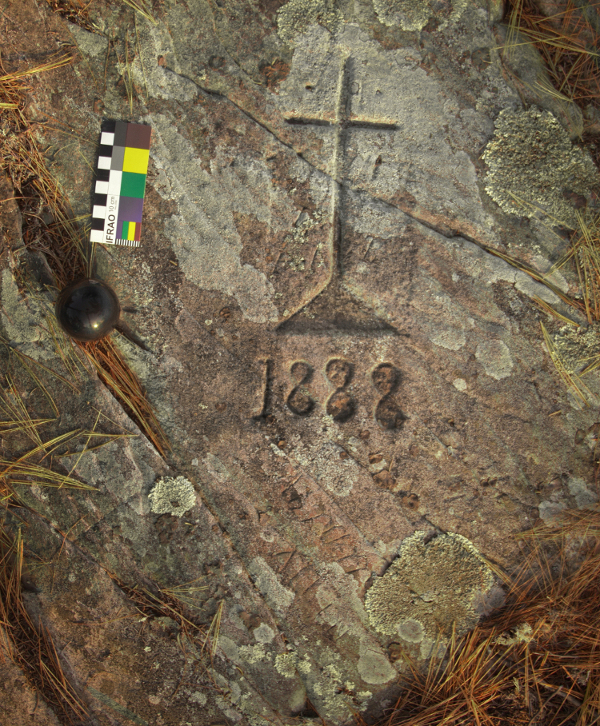 In Nova Scotia, images of ships, hunting scenes, male and female figures, and even dates carved into the rock document the arrival of Europeans and important facts in Mi’gmaq history. Rock art images are endowed with powers enabling them to act and influence the world of humans. Hence, rock art can contribute to healing, be part of sympathetic magic and impact the outcome of hunts. The images sometimes represent prophecies or future events. Rock art sites also served to mark the territory for various purposes. In British Columbia, certain sites indicate ideal locations for salmon fishing or mark the boundaries of various groups’ territories on the landscape. Rock art is often found along waterways, like lakes and rivers, at strategic locations such as portages or at crossroads. In the Canadian Shield, travellers could stop at such sites to ask spiritual entities for protection. Rituals were practised to invoke supernatural beings for their help or to ensure safe, successful travels. The Nlaka’pamux (Salish), who live in the south of British Columbia, created images to seek protection from the spirits against enemies or adversity such as disease. Several stories linked to rock art sites are known and transmitted within Indigenous communities. Many stories are only transmitted among the initiated, since they are part of sacred wisdom and are not accessible to the public at large. However, some knowledge does reach us to help us gain a better understanding of the wealth of the rock art phenomenon. 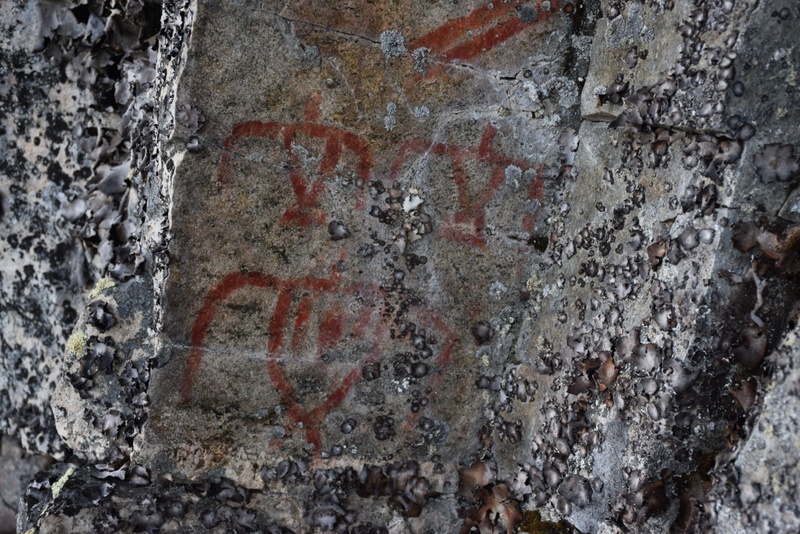 The following story recorded in Manitoba provides more details on the close connection between rock art, medicine men, Memekueshuat and their spiritual healing powers. A woman of the Oxford House Band was very sick. Her family asked an old man named Mistoos Muskego to come and cure her illness. He tried again and again to cure the woman, but nothing seemed to work. Eventually, the old man said that there was only one hope left and that was to go and ask the men who lived in the rock if they could give him the powerful medicine needed to cure her. He left in his canoe and paddled up to where he knew the men who lived in the rock dwelt (today this spot is a tall granitic rock face rising sharply above the Semple River, as it was in Mistoos Muskegos’ days). The old man was very powerful and used his power to enter the rock and unto the home of the men who lived in the rock. He talked with them for a long time and asked for the medicine that would cure the woman; in the end, he was given the medicine that he requested. He then left the rock and paddled back to the home of the woman who was ill. The medicine was given to the ailing woman, who was later cured. The old man said that all should remember that it was the powerful men who could give medicine to a powerful old man. He then made a paint and asked all the people to come with him to the home of the men who lived in the rock. Everybody paddled their canoes up to the rock, where the old man left his canoe to stand on the rock ledge by the water. He told the people gathered how he had received the medicine. He then said that no one should forget the men who lived in the rock and that he would draw a painting of them. The old man drew an approximately two-feet-high painting of stick figures with lines running from their heads that gave them a rabbit-eared look. The people would now remember where these beings dwell and what they look like. Then everybody returned home. Story told to C. J. Wheeler in the community of Bunibonibee Cree First Nation (Oxford House). Story adapted from Wheeler, C. J. (1975).